You asked for it, and here it is: Savage Mojo's well-loved, high-quality art applied to map tiles that we've designed specifically for open-plan warfare. When the titans of your imagination clash, they can do it on finely detailed grasslands that we've recreated in all their resplendent glory on your gaming table. The ground isn't cluttered with mountains or pre-rendered buildings—use the set for any game where a stretch of grass is what you want, from fantasy to sci-fi, western to waterworld (well, maybe not that last one). For increased flexibility, and because you asked for it too, we've produced this battlefield in two versions: with the regular 1" square grid and with a hex-based version, both included when you buy this product. 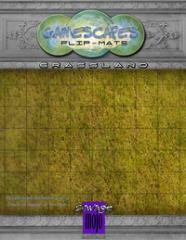 Now you hex-based wargamers can join in the Gamescapes fun! The print edition is a double-sided 24"x32" mat, with hexes on one side and squares on the other.